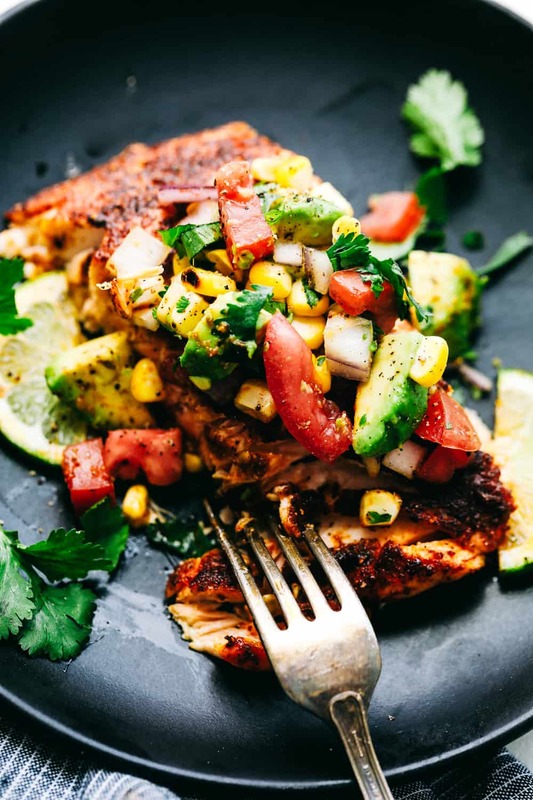 Grilled Salmon with Avocado Salsa is a tender, juicy grilled salmon, topped with a colorful and flavorful combination of avocados, corn and tomatoes to make a light and tasty meal. This Salmon is made in minutes for your family! This Salmon is one of our favorites and all comes together for a simple and delicious dinner under 10 minutes! Garlic Brown Sugar Glazed Salmon, Sheet Pan Garlic Lime Salmon Fajitasor Buttery Garlic Lime Salmon with Asparagus in Foil are a few of my top Salmon recipes that are sure to please! This grilled salmon is healthy and packed with flavor. Anything topped with avocado salsa is amazing in my book. The great thing about salmon is that it only takes minutes to cook. And it is so tender and flaky and melts in your mouth. 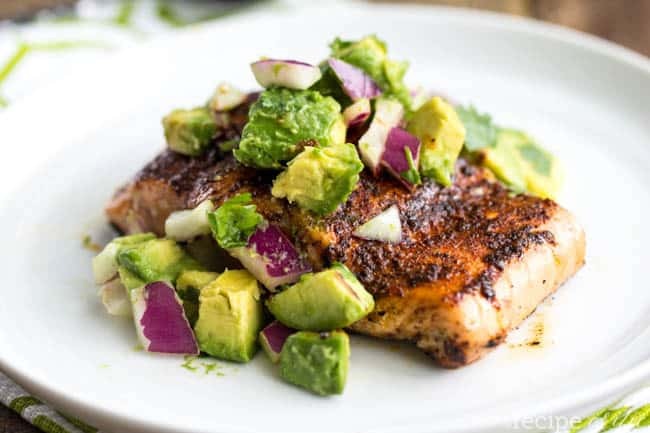 This is a simple grilled salmon recipe and it is ready in the matter of minutes. The spice rub gives it such amazing flavor. I loved this recipe so much. And the avocado salsa was the perfect finishing touch to this amazing and healthy meal! 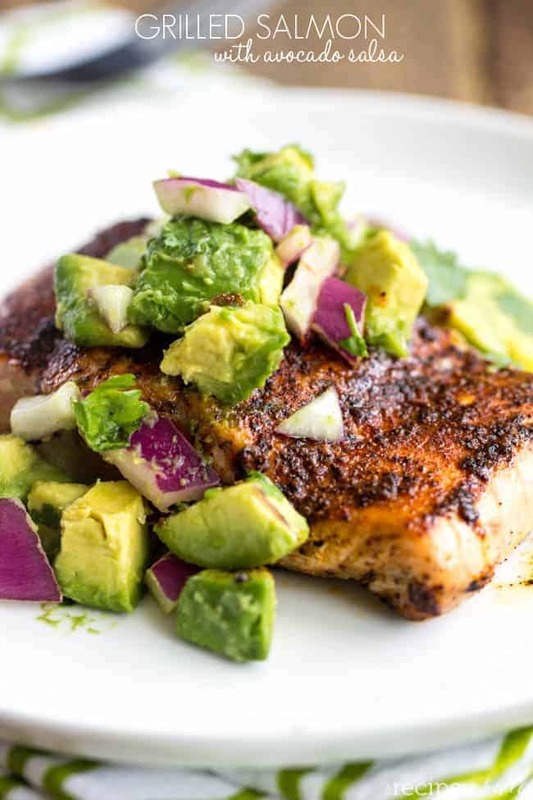 How Do You Make Grilled Salmon with Avocado Salsa? In a small mixing bowl combine salt, chili powder, paprika, onion powder, garlic powder and black pepper. Rub the salmon fillets with the olive oil and rub with the spice mix. Grill the salmon on medium heat for about 3-5 minutes or until desired doneness. Mix the avocado, Roma tomato, red onion, chopped cilantro, salt and juice from the limes in a small mixing bowl. 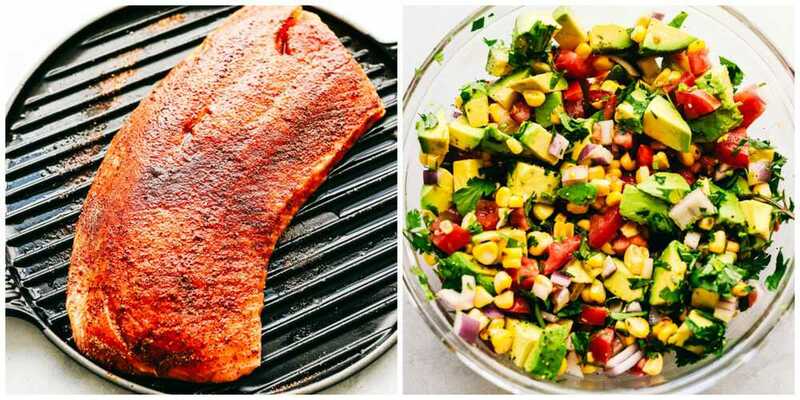 Top the salmon with the avocado salsa. Many people often describe salmon tastes as quite different from the regular fishy taste. In fact, the taste of salmon is just like a mildly flavored meat that came straight out of the sea. Salmon often has a subtle and refreshing taste. However, its taste will depend on the recipe used to cook the fish. What Temperature Does Grilled Salmon Need to Be At? The USDA recommends that fish needs to be cooked to an internal temperature of 145 degrees F. However, some say that salmon is overdone at this point. For a medium to medium well cook on your salmon, remove the salmon from the grill when it reaches 125-130 degrees F and let it rest for 5 minutes. How Do You Know When Salmon is Done Grilling? To test grilled salmon for doneness, flake with a fork and look for opaque color, or use a meat thermometer. When grilling salmon with the skin on, let the skin get crisp and brown. This way, the fish will pull away from the skin when you turn it. Using a fork, check the flesh at the thickest part of the fillet. Do You Cut the Skin Off of the Salmon Before Grilling? First of all—skin is tasty! So when you’re cooking salmon, keep that skin on. It provides a safety layer between your fish’s flesh and a hot pan or grill. Start with the skin-side down, and let it crisp up. It’s much easier to slide a fish spatula under the salmon’s skin than under its delicate flesh. If you prefer no skin, that is great too! The skin can come off easily and still tastes and cooks just as great! 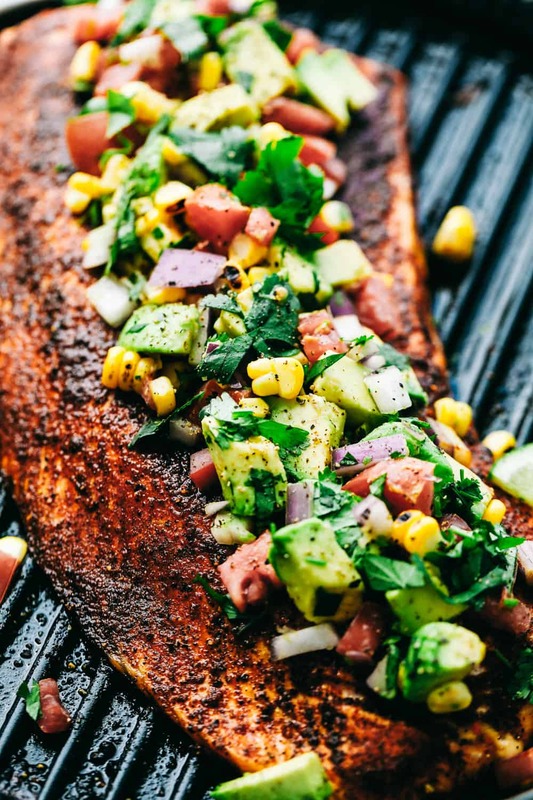 How Do you Keep Salmon From Sticking to the Grill? Start with a clean grill and get it nice and hot. Grease the hot grate generously. Put oil on both sides of the salmon. Place the fish on the hot grill (skin side down if it has skin) diagonally across the grates. Turn the fish over after it has cooked for about 3 to 5 minutes. The avocado is a tree, long thought to have originated in South Central Mexico, classified as a member of the flowering plant family Lauraceae. The fruit of the plant, also called an avocado, is botanically a large berry containing a single large seed. Which Avocados are the Best? Ripe fresh avocados that yield to gentle pressure should be eaten within a day or two. For events, a four to five days out, purchase firm avocados instead. Unripe, firm or green fruit can take four to five days to ripen at room temperature, perfect for celebrations that are a few days out. Looking For More Salmon Recipes?! Here are some! 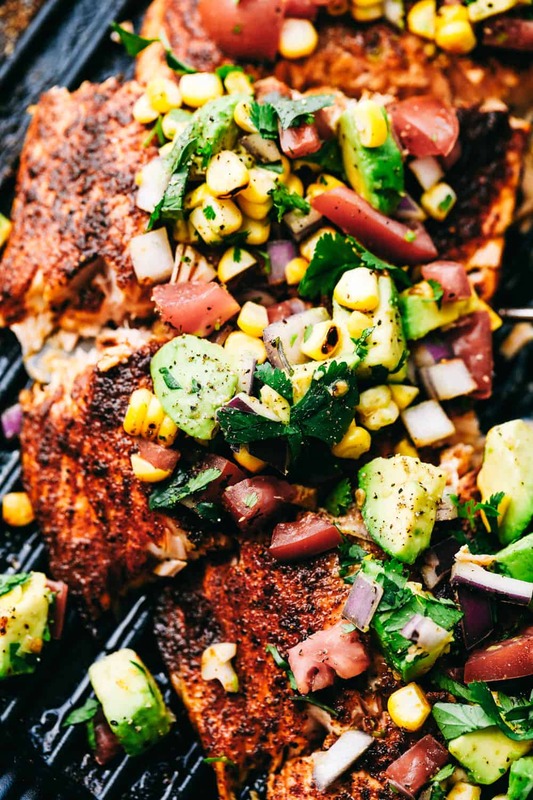 Salmon that gets grilled in the best spice rub and topped with a fresh avocado salsa. We have been looking for a salmon recipe and no need to look further, this is perfect! Alyssa, this gives me so much hope! 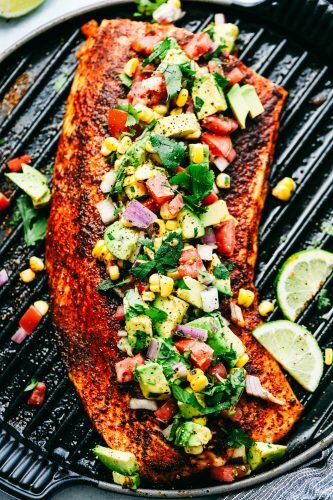 My husband is a total fish hater but maybe he’ll come around with this gorgeous salmon 🙂 Love that avocado salsa you put on top! This sounds like a quick and delicious week night meal! I like salmon, but I still don’t cook it often enough. I’ll definitely have to try this soon! This turned out amazing! I’ve never grilled salmon before and it was so easy to make! Loved this recipe and will definitely make again! This looks and sounds amazing! Any recommendations on how to cook the salmon on a pan or baking it? I don’t have a grill! Thank you! This recipe is super easy, quick and the avocado salsa on top is amazing! This has become a weekly staple in my home. Thank you!!! !